It's either a monumental oversight or we have a mutiny on our hands. In any case, it's more bad news for clean air and the climate here in Colorado. Responding to public comments on the air pollution permit for Xcel's Valmont coal-fired power plant in Boulder, the Colorado Air Pollution Control Division recently rejected calls to keep carbon dioxide emission in check at the plant. The reason? According to the Division, "there are no state limits on carbon dioxide" emissions. In 2008, Colorado Governor Bill Ritter issued Executive Order D 004-08, which set a goal of reducing greenhouse gases statewide 20% below 2005 levels by 2020 and 80% by 2050. Let me put this another way: in 2008, Governor Ritter ordered that greenhouse gases be limited in Colorado. And given that coal-fired power plants are the largest source of greenhouse gases in Colorado, it's clear that if we have any hope of meeting these limits, we're going to have to focus on keeping carbon dioxide in check from plants like Valmont. Of course, maybe Governor Ritter's Executive Order is simply a meaningless pile of crap that was only meant to placate farmers, ranchers, scientists, water users, ski area operators, hunters, fishermen, wildlife enthusiasts, outdoor recreationists, and everyone else in Colorado that stands to lose from global warming. I hope not, but who knows. For now at least, the message from the Colorado Air Pollution Control Division seems clear: "Governor Ritter, we think your Executive Order is meaningless." But the message to the concerned public seems even more flippant. The Division's response came after nearly 300 people packed a public hearing last July, all of whom called for the agency to keep carbon dioxide emissions in check at the Valmont plant. Sure, the Division claims it is "sensitive to public concerns regarding greenhouse gas emissions and their impact on the environment," but actions speak louder than words here. For now, the Colorado Air Pollution Control Division has given the green light for the Valmont power plant to continue spewing global warming pollution. That action speaks volumes. 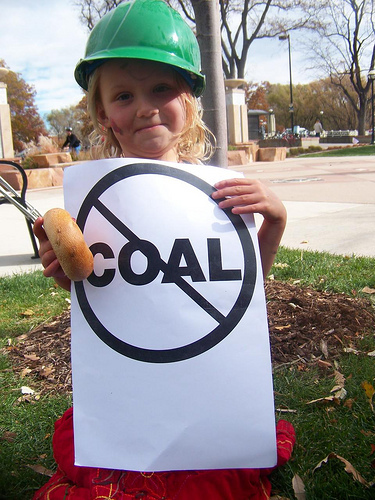 A young activist says no to coal at the 350.org International Day of Climate Action rally at Municipal Building, Boulder, Colorado, USA. 24 October, 2009. Photo by Doug Grinbergs.